Success meant the heady exhilaration of cheering on the polished gym floor, the yells seeming to swing the bright hot gym up and out into the night. And so her want was intensified. When you write a novel about cheerleaders, even a dark crime novel, two things happen: People ask you if you were ever a cheerleader (I was not) and they confide strong feelings about cheerleaders, whether it’s their own experience of failing to make the high school squad, or the ponytailed captain who broke their heart a decade ago or more. And sometimes they give you books. 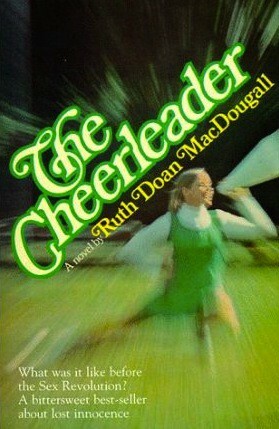 Such was how I discovered Ruth Doan MacDougall’s 1973 novel, The Cheerleader, which was pressed into my hands by novelists Greg Herren and Laura Lippman earlier this year. A massive bestseller when first published, eventually spawning a TV pilot and four sequels, The Cheerleader was a phenomenon, possibly catching that burned-out 1970s wave of nostalgia for the “innocent 1950s.” (e.g., Happy Days, Grease). While on the surface depicting a world of — as the promotional text promises — “ponytails, pajama parties, proms, and ‘parking,’” the novel turns out to be much more, a twisty tale of social ambition, sexual frustration and gamesmanship and a rough and unsentimental female coming of age. She wanted to be one of those fabulous Varsity cheerleaders cheering at a game that mattered, for the boys who mattered, the crowd caring passionately and she herself one of those who led them. … beyond the goal of a glamorous women’s college was the goal of fame. She wanted to be famous because she knew one day she was going to die… Snowy wanted to be famous so she could live forever. For all the current cultural scolding of the “shallowness” of “celebrity-obsessed” youth today, we can see that this kind of adolescent yearning is forever, and that it’s not so much a sign of shallowness as much as it is a vital part of figuring out one’s identity — a way, even, of reckoning with mortality. Snowy wants something bigger, more meaningful. She just doesn’t know what it is, or how to get it. He was getting a hard-on. So was Snowy, but she didn’t know it. She knew only an awful ache. Yet she had discovered, a few years ago when her pajama bottoms got twisted in bed, a secret she kept even from Bev, and since then when the ache became unbearable she had intentionally twisted them until the night seemed to explode, she didn’t know why, she didn’t know what it was all about, such pleasure and such shame. Snowy was shivering. ‘It’s over,’ she said. And it is. She ends the relationship. Ultimately, she’s achieved her girlhood dream of becoming glamorous cheerleader with dashing boyfriend, only to find the dream — at least in their achievement — hollow and aching. Instead, she finds her gaze shifting off into the horizon, a world beyond her constrained New Hampshire town. In the final paragraphs, Snowy opens her acceptance letter to Bennington College and its accompanying scholarship offer. Megan Abbott is the Edgar Award–winning author of six novels. She received her PhD in literature from New York University and has taught literature, writing, and film at NYU and the New School. Her latest novel, Dare Me, is out in paperback this week. She lives in New York City.